My siblings and I recently scattered from our hometown in the Midwest to various extremities of the nation — one moved to L.A., one to D.C., one to Philadelphia (and all within a two-month time frame, no less). I don’t miss them as much as I thought I would, though, because I can keep up with their lives through Facebook. True, this is one of the main uses for Facebook in the first place, but keeping up with family is different from mindlessly scrolling through my news feed to learn what Adam from high school ate for lunch. You can even create a group specifically for your family (extended or otherwise) to share information and updates more freely without worrying about others’ privacy settings. In a secret or closed group, posts are only visible to group members, and members must be approved by others. Group members can chat, upload photos to shared albums, collaborate on shared documents, and invite all members to group events easily. Similar to creating a group to keep in touch with family, creating a Facebook page allows organizations, businesses, celebrities, and bands to keep up-to-date with people. Unlike groups, however, only “official representatives” of the organization can create Facebook page. Also unlike groups, page information is public. Others only need to “like” an organization’s page to have that organization’s updates appear in their News Feeds. Not in charge of a multi-billion dollar corporation? Not a problem. Facebook pages are also useful for promoting your Etsy shop, eBay store, or your freelance design business. If you’re wary of status updates, you can search for a company on Facebook. If that organization has a page, and you have any friends who have indicated on their profiles that they work for the company, this will appear on the company’s Facebook page. Along those same lines, you can use a company’s Facebook page to learn more about their values, programs they have, and where they do post job openings. Quickly and easily create an event by clicking on “Events” on the left-hand side of your Facebook page in the newsfeed view. There you can manage invites (choose whether the event is public or private, as well as whether guests can invite other friends), keep track of RSVPs, and add essential information for guests. Using the Events App on Facebook is superior to managing RSVPs with, say, an old-fashioned Excel spreadsheet for obvious reasons. It’s also superior to e-vite websites, though, because you don’t need to know guests’ e-mail addresses, you can add guests or update information quickly and easily, and you don’t have to sign on to a third-party site just to manage your event (you’re on Facebook everyday anyway, right?). This is a variation on the use above; however, it goes beyond just using the Events App. If you have a significant event to market — say, a nonprofit’s annual fundraiser — you can market it in several different ways on Facebook. Create a public event that is searchable and allows guests to invite others to extend your reach. You can also consider creating a separate Facebook page for your organization if it doesn’t have one already, and link to that page in your invite to the event. Also, get in your friends’ direct line of sight by posting a status update informing them of the event and asking them to share with people they think might be interested. You already have an e-mail account or two. Why would you possibly want yet another? Facebook e-mail integrates your e-mail with your messages, chats, and texts. That way, you only need to look in one place to see all types of Facebook messages. You can even have other e-mails (Hotmail, Gmail, and Yahoo, for example) sent to your Facebook account. Don’t know where your Facebook e-mail is? Go to Messages (it should be on the left-hand side of your news feed) and choose “Claim your Facebook email.” One caveat — messages sent from your Facebook e-mail to external addresses look like a Facebook message, complete with name and profile picture. For that reason, I would hesitate to use Facebook e-mail for work-related communication. Facebook users install apps over 20 million times every day on average. If you’re going to jump on the bandwagon, pick those that will help you be more productive. Start off with Facebook Docs to seamlessly integrate document sharing with Facebook friends. Launched in April 2010, Docs is still in beta mode. However, it may have a leg up on Google Docs because Word, Excel, PowerPoint, and PDF files can be shared with one click with an entire Facebook Group. Another way to integrate Facebook with your other communication needs is through Facebook Messenger. This app allows you to send Facebook messages to your friends’ mobile phones, or to receive messages from friends on your own phone. Don’t like the idea of Facebook syncing your cell phone contacts to your Facebook account? Learn how to change that privacy setting. Lastly, find more productivity apps specific to your needs by searching the comprehensive apps list. In addition to creating a Facebook page for your blog, you can also publicize your blog by using WordPress’ Facebook Plugin, which automatically publishes blog posts to your Facebook account. This allows your post to pop up in friends’ News Feed. If they “like” your post or comment, it will show up below your post on your site. In addition, Facebook friends will have a “send” icon to easily e-mail your post to others. Blogger, TypePad, Tumblr, and essentially all the other free blogging sites out there have similar widgets. Alternatively, you can import your blog into Facebook using Notes. And, of course, you can always share individual posts by pasting the link as a status update. Like Amazon, eBay, and Craigslist, Facebook Marketplace is another way to unload unwanted items. Listing items on Marketplace, like Craigslist, is free. The big draw of Marketplace is that people have the option of publicizing their posts in friends’ News Feeds, although items are searchable by others as well. Visitors to the Marketplace can ask questions on the “wall” of the item posted, or can comment (if, for example, they have a similar item and have a positive review). Another reason to use Marketplace — it’s another forum to sell your stuff. Listing items (or searching for items you want) in a variety of places is sure to get your needs met more quickly, or more accurately, than would searching in one place alone. Facebook has a heart. That’s right; its power can be used for evil and for good. Have a charity you strongly believe in? “Like” its Facebook page to learn more about how you can help and to stay up-to-date on its initiatives. If there’s a cause you support that doesn’t have a page (a small, local cause, for example), create your own Facebook page for that cause and share its mission to a broader audience. In addition to promoting a cause, you can also help financially with Facebook Marketplace. Using the Sell for a Cause feature of Marketplace, you can sell unwanted items and donate the proceeds to participating nonprofits (there are over a million to choose from). Facebook claims over 800 million active users of its site, meaning that if every active user donated $1 of profit to charity, over $800 million would be raised. Not too shabby. 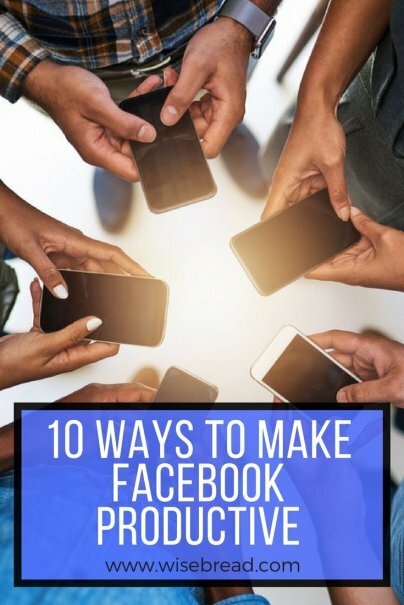 I was just at a conference where one of the speakers recommended catching up with 10 people a day to keep yourself remembered in your social networks -- and it can be as easy as posting on the Facebook page of someone you haven't talked to in a while. I sometime wonder if all my efforts on facebook will eventually be wiped out when another social media comes along.